We are delighted to announce that plans for a community orchard at The Big Park will be coming into fruition this year. We will be teaming up with Brighton Permaculture Trust to plant fruit trees that will be planted and maintained by the local community. The first step in the creation of the orchard is planting a hedgerow shelter belt that will protect the fledgling fruit trees that will be planted in autumn 2015. 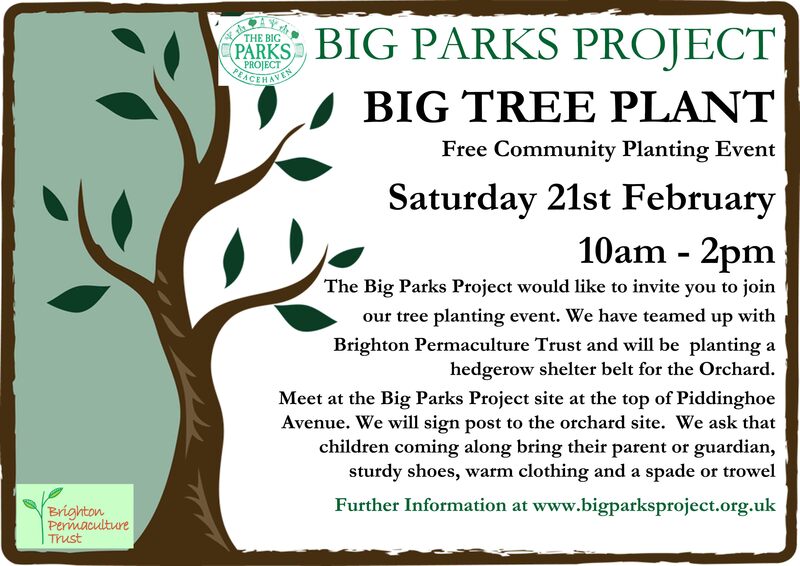 If you would like to be involved in this initial stage of planting we will be holding a planting session at The Big Park on 21st February 2015 with Brighton Permaculture Trust. No experience is necessary and children are welcome as long as they are accompanied by their parent or guardian. Please wear sturdy footwear and appropriate clothing. If you enjoy the experience there will also be the chance to sign up for a course on fruit tree and orchard management with Brighton Permaculture Trust. This is a community orchard and we hope that as many people as possible will be involved in not only planting the initial trees but looking after them in the years to come.